How one coalition campaign is using online technology to more easily give leadership roles, visibility and branding to every group. Getting organisations to work together toward a common goal can be unpredictable. Coalition work can take much longer than expected. Coordinated actions often fail to get needed results. Coalition campaigns could be compared to a version of Too Many Cooks, a comic take on the chipper opening credits of an imagined TV sitcom. The credits inexplicably spin out into an 11-minute surreal comedy masterpiece. Beyond the catchy refrain, this internet arcana offers a useful metaphor for nonprofit coalition work. How will the coalition present itself publicly? How will they reach agreement on positioning and messaging? How will the groups share their lists and how will newly-acquired supporters be distributed amongst the partners? Too often, valuable campaigning time gets spent building consensus for new campaign branding and taglines and campaign messages are watered-down and uninspiring. Campaign sites tend to suffer from logo stew, as every org needs to be recognized and feel included. These concerns were top of mind when my partner and I began work with a coalition of Canadian environmental orgs. The federal government has committed to revisiting a series of critical environmental laws and Canadian ENGOs want to make sure they get those laws right. 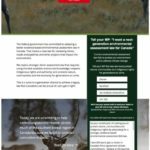 The campaign asks Canadians to pressure their Members of Parliament (MPs) to write laws that provide the strongest possible protections for land, air and water. To achieve scope and reach over the summer months and into the fall, we knew the campaign would need support from a much broader range of groups across the country, in both official languages. How could we create a quick, effective campaign that steered clear of typical coalition issues while being easy for other groups to adopt and promote? And how can we help Canadians act in support of the particular legislation they care most about without getting bogged down in the language and bureaucracy of federal law reform? There are four laws under review. We began by creating single-page campaign sites in French and English for each law, each with its own URL. We used the new top-level domain .eco, as it aligns with the campaign, plus we were confident we could get the URLs we wanted. An example of the generic coalition site. As you can see, the sites are attractive but generic. 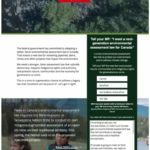 They’re classic landing pages, designed with a single purpose in mind: give Canadians enough information about the issue so that they’re motivated to contact their MP about it. While the language on the pages was carefully crafted in collaboration with the coalition, these generic pages are totally without branding. 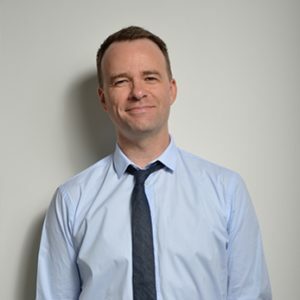 These sites were built using a combination of Unbounce and New/Mode. We selected Unbounce not so much for its core testing functionality, but because we wanted to be able to replicate and tweak individual pages easily. We then embedded New/Mode ‘email your MP’ (Member of Parliament) and, in one case, ‘send a letter to the editor’ forms into these. In addition to their email functionality, these forms offered the critical bit of infrastructure of matching a Canadian’s postal code to their MP or nearby news publications. We can now make a copy or ‘clone’ of whichever pages coalition members want to use. If each group is a cook, now they all have their own kitchens. Building on our core coalition of four Canadian orgs, we reached out to more than 30 other organizations. This was a time-intensive process, made simpler by the fact that we had a simple, customized offering for them in a cloned site. We add a group’s logo to their cloned microsite(s), make any image or text changes they want and provide them with a unique URL that they can could drive supporters to. With this model, organizations can confidently direct their supporters to their custom landing page knowing that it features their logo and familiar language, and that they own any new supporters who sign on through the page via social media. Some groups want to activate their supporters on all four laws under review, while others focus on one particular law reform. For example, the David Suzuki Foundation (DSF) had already been campaigning for a stronger Fisheries Act, so we created a Fisheries Act microsite for them at GetFisheriesRight.eco/DSF. So far, we’ve created 55 cloned sites for 26 groups participating in the campaign. 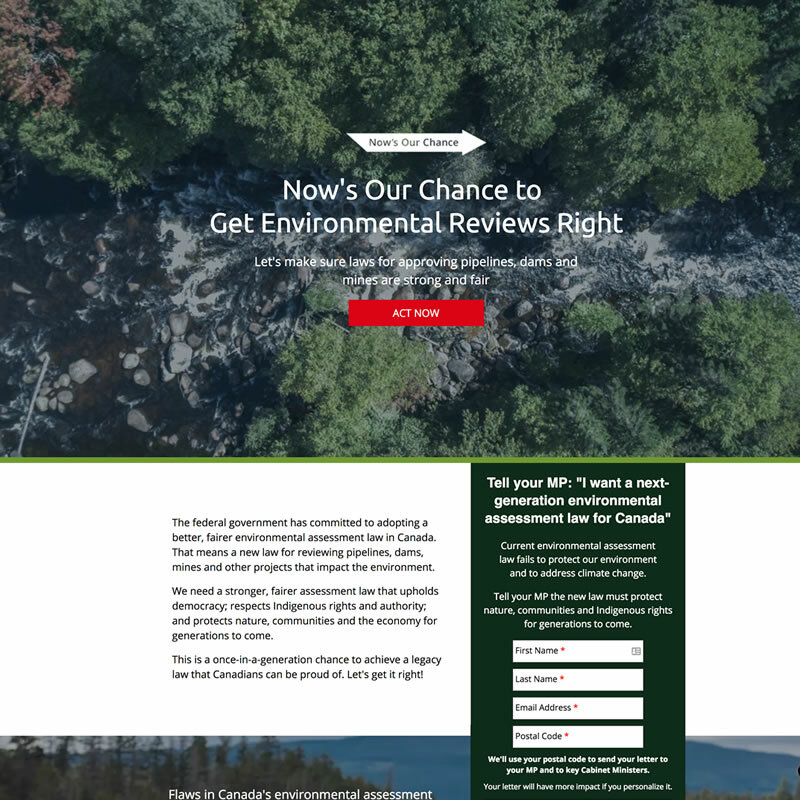 Below, you can see screenshots of four sites for reforming the Environmental Assessment Act. 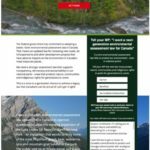 The first two are the generic French and English landing pages, followed by customized versions for Canadian Parks and Wilderness Society and WCS Canada. Have we managed to avoid the usual campaigning hangups that accompany coalition work? By providing cloned sites to each group, fewer anxieties exist around shared assets and lists. Because each group can tweak the language and look of their own pages, no formal consensus has to be reached. Groups can feel confident promoting their unique URL through all their communications channels. Likewise, the average supporter has a relatively seamless user experience. 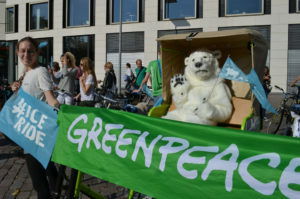 While supporters aren’t driven to the group’s own website, at least the landing page URL includes the organization’s name and the page features the group’s logo and contact details. While conversion rates vary broadly among the groups,, these pages are seeing an average conversion rate of 66%. 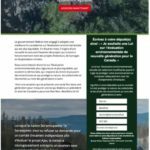 So far, Canadians have emailed over 40,000 letters to their representatives using these sites. The law reform process continues throughout the winter, so it’s too early truly understand what impact those letters are making. As we get closer to tabled legislation, the model will scale and the coalition continues to grow.